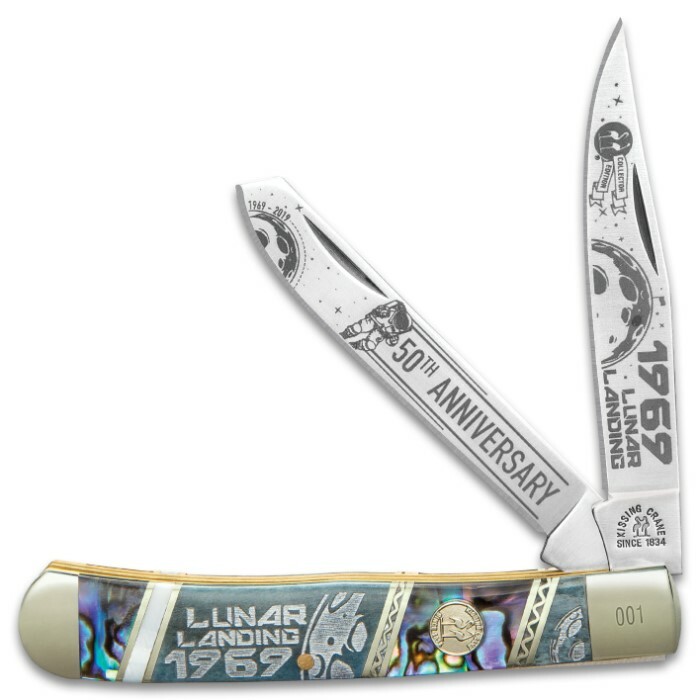 Commemorate the 50th anniversary of landing on the moon with the Kissing Crane Lunar Landing Trapper Pocket Knife. 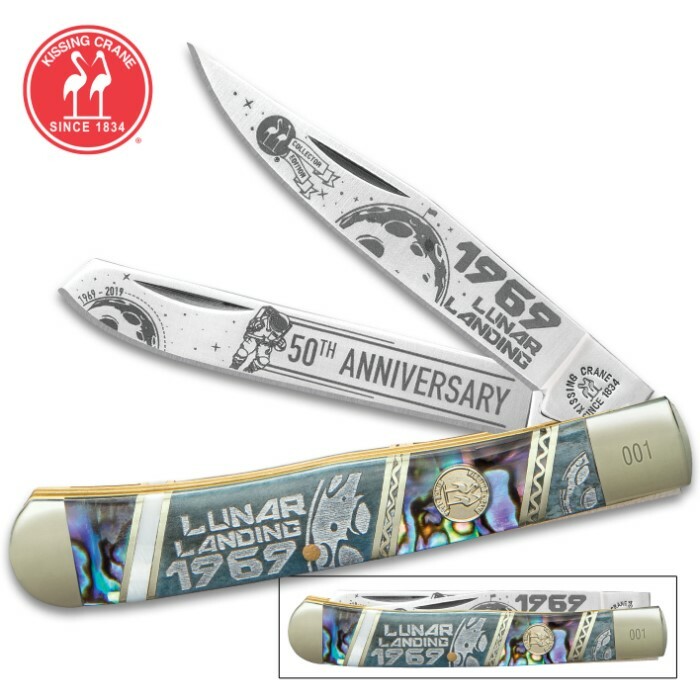 This limited, anniversary edition pocket knife has two razor-sharp stainless steel blades featuring 50th Anniversary moon landing themed etchings. 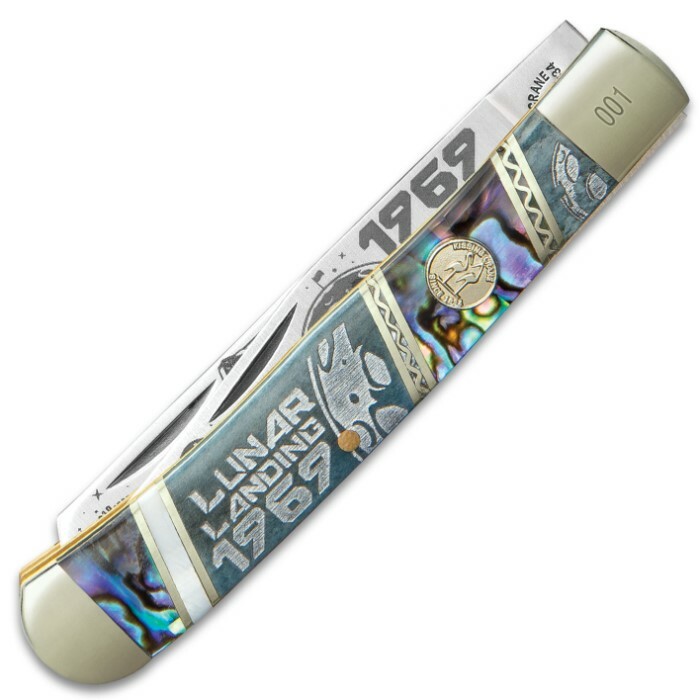 The handle is crafted of genuine abalone and bone with “Lunar Landing 1969” etched on it. Nickel silver bolsters and the classic Kissing Crane cast shield complete this exquisite design. Each one is laser serialized on the bolster. This beautiful knife was given to me by an old friend. He knew that I was part of the Apollo 11 and Apollo 12 recoveries aboard USS Hornet CVS-12. The knife is a great memento of my experience. The knife is well made and is VERY sharp. I am long time fan of Kissing Crane knives, and this folder will not disappoint. This one like my other KC collector folders has good and firm action. The blades do not wiggle when in the open position like some lesser quality knives. The etching is centered on the blades and done quite well. This piece is a nice addition to my collection and it brings back fond memories of a time when the whole world was watching history being made.